So I am back from a wonderful holiday. Of course I took rather a lot of photos, and as we did a lot of moving about (I think the most we had was 3 nights in the same place) there is a lot of recapping, so I will do a few posts on it. Because our flight was from Gatwick, which is basically in Brighton, and we didn’t fancy the two hour drive in rush hour, we got the train the night before and stayed in the Premier Inn, which meant we had a nice relaxing start the next day. The flight was long, (10 hours I think) – we flew with West Jet who are a sort of low (lower) cost airline- no food on board, no entertainment (although you could get an app and then watch things that way)- but that suited us- we bought some snacks with us and a nice sandwich in Pret, and I had downloaded a few things from i-player to my tablet which helped pass the time. 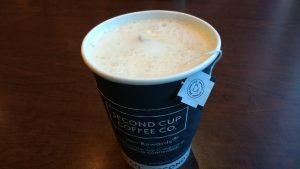 We landed in Calgary just after lunch time there, and headed to an outlet mall for a bit of shopping (and a London fog latte for me, oh how I love them) before driving to Drumheller. 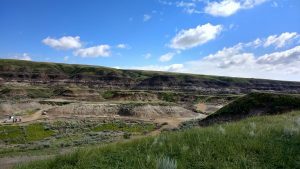 We had seen this place on The Amazing Race Canada (I love this show- a bit like a travel show crossed with the Crystal Maze)- it’s a canyon where loads and loads of dinosaur fossils were discovered, and there is a museum as well as trails through the badlands. Due to jet lag, we were at the museum before it even opened! The scenery was very interesting, and we took part in a guided hike around the badlands as well as visiting the museum. 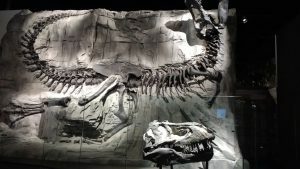 T-Rex called “Black Beauty”- the real skull was too heavy to be held in place. It was set up really well, with a pathway to follow, lots of information about the fossils, and you could even look through a glass partition and see people working on the fossils. 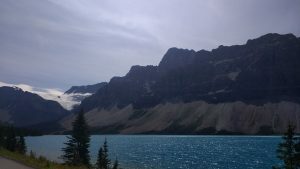 We had a fairly long drive to Banff so after stopping to look at some hoodoos (rock formations) we headed off. 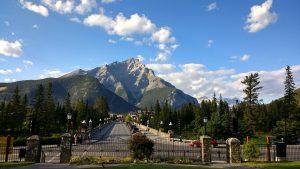 We saw plenty of wildlife on this drive including deer and elk, and early evening arrived in Banff. Our room had lovely views of the mountains, and after relaxing for a bit we headed into the town, which I think is the most scenic high street in the world. The road lines up perfectly with the mountain. 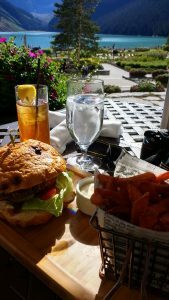 It is such a good town to stay in- it has that sort of apres ski vibe with shops, cafes and restaurants open in the evening. 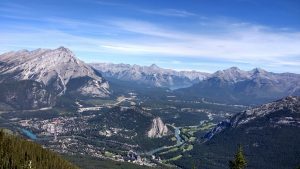 During our days in Banff we walked around a nearby lake, hiked up to some waterfalls and took the gondola up the mountain for panoramic views. 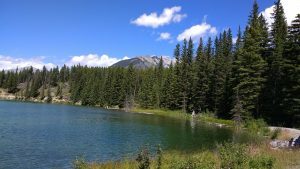 We saw a beaver in the water at this lake- we were not quick enough to take a photo though. Driving back after visiting one of the waterfalls, we noticed a lot of cars pulled over (wildlife jam) and were very excited to see a bear! A little later it wandered across the road. Some people were getting very close and it did a bit of a charge to scare them off- I think people forget that they are wild animals. 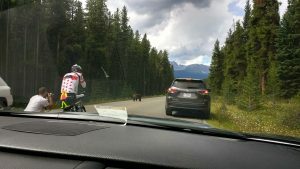 We had seen bears in Glacier park in the US, but never in Canada (and 7 years ago we visited Banff and Jasper and spent all of our journeys peering out of the car in hope of spotting one). We had some lovely food too- we found a nice veggie place called Nourish which made very tasty nachos (covered in everything from cheese to blueberries), and a burger bar (Eddie’s) which had a menu, but also a create your own, where I had a veggie burger with peanut butter, pickles and blueberry chutney. Sounds weird but it was delicious. 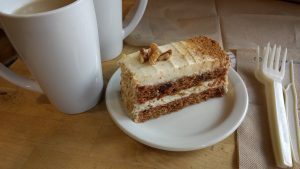 Of course we found a bakery too (Wild Flour bakery)- we had been hiking all morning and did’t get into town until around 3pm- we shared carrot cake and it was so tempting to eat it while we were waiting for our sandwiches to be made! We planned to go back for breakfast as the almond croissants and cinnamon rolls looked so good, but when we got there they had none- how disappointing! 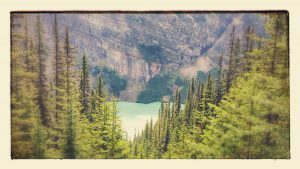 After a few days in Banff, we headed a hour or so north to Lake Louise. 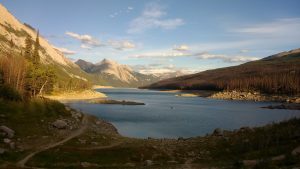 Again, we had visited here before, and last time tried to make the hike to the Lake Agnes tea house. The hotel were very helpful in providing a map, and we realised that last time we had headed off in the wrong direction completely. This time the hike was a success! It’s just under 3k from the hotel to the tea house, but at times it is fairly steep, lots of switchbacks, and of course at a high elevation too, so it was hard work. We had been warned that the tea house was cash only (no electricity, they boil the water over a fire, although someone did ask if they had wi-fi…)- the people who work there stay for about 4 nights before hiking back down. 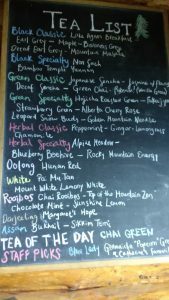 Anywhere with this long a tea list is good for me! We then walked around the lake, and then attempted to climb up to another look out, but the switchbacks were very steep, the ground was covered in loose stones, and I could see the lake below me (I am not keen on being on a steep slope like that) so we gave up after getting most of the way there. I had to clamber down some of it sitting down as it was just so steep. From the far side of the lake looking across to the tea house. After hiking back down we were pretty shattered, in a good way (we had walked about 6 or 7 miles and pretty much none of it was flat), and so enjoyed dinner with views of Lake Louise. 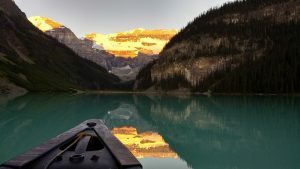 The next morning Andy had booked a surprise for us- a sunrise canoe on Lake Louise. We had to be ready at the boat house for 6am- early indeed! They gave us a hot drink and a bag with some breakfast food, but I have no idea how people either drink or eat whilst paddling and not dropping the oar into the water. I was very nervous about falling in (the water is so very cold) but after a bit I got used to it. The scenery was amazing, and it was so peaceful to be there in the middle of the water. I even braved a few photos, carefully balancing the oar on my lap. The reflections of the sun coming up were just amazing to see. 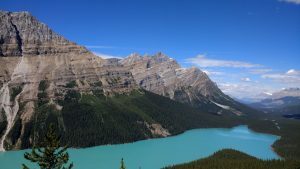 We were only there for one night, so after that we drove up the Icefields Parkway, stopping at Peyto lake (amazing, shaped like a wolf) and the Athabasca glacier, before getting to Jasper in the afternoon. Our first stop in Jasper was the Bear’s Paw bakery, which we loved last time we went. It did not disappoint! 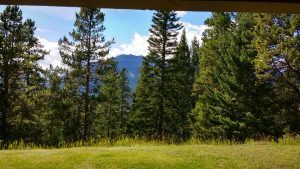 Driving up to our lodge we saw an elk, and two bears! Andy joked that I should run down to the village in the morning to get our breakfast, but with all that wildlife close by I declined! Lucky I didn’t because the next morning we saw a bear by the side of the road, happily eating berries and seemingly oblivious to our car. Around Jasper there were more amazing lakes and views to be seen. 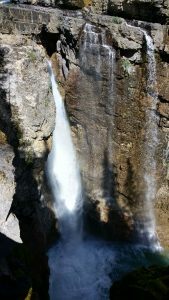 Some of the hikes only allowed groups of four or more, due to bear activities, so we had to stick to the more populated paths. 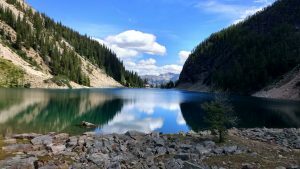 Lake Annette- a lovely path (5k I think?) lead around the entire lake with beautiful views at every turn. Medicine Lake (it looked very different from last time as there had been a forest fire so a lot of the trees were gone, or black). 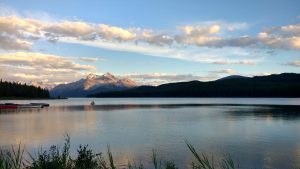 Maligne Lake- you can do a cruise here for one of the most famous photos of the Rockies (Spirit Island) but as we did that last time we stayed on the shore this time. 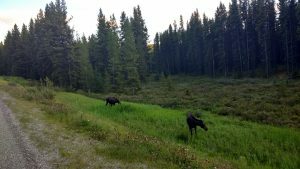 On the way to Maligne lake we saw two moose by the side of the road! 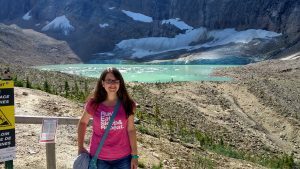 We hiked along the trail at Mount Edith Cavell to see a lake filled with icebergs. 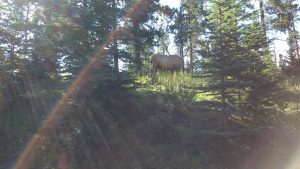 On our way back from seeing the Athabasca falls, there was another wildlife jam. At first we could not work out what it was, but then we saw it was a bear up a tree! 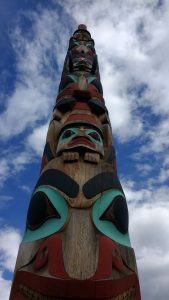 One afternoon we had a walk around trails close to Jasper town- this totem pole is in the town centre. 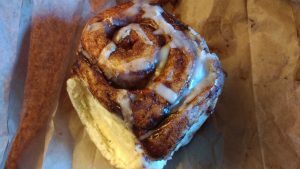 On our last day we shared one of the Bear’s Paw’s legendary sticky buns- so good, and bought a pb&j to have as lunch on our journey. 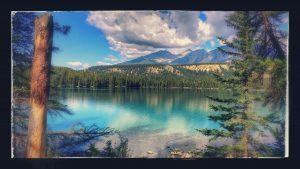 We then drove back down the Icefields Parkway, stopping by another stunning lake for lunch. 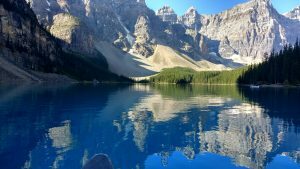 We were staying at Moraine Lake, which is very close by to Lake Louise. Our hotel stay included a canoe hire, but it was a bit windy in the evening and they weren’t letting people go out, so we walked around the lake instead. The next morning the weather was perfect so we spent about 45 minutes on the lake, before checking out. 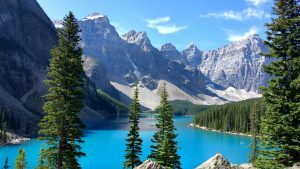 Have you ever been to Canada? Would you be tempted? What sort of activities do you like to do on holiday?